This diagram shows that the growth of world human consumption is driven by world population and world human per capita consumption. Both population and per capita consumption have positive feedback loops that force them to grow. Population growth is driven by a natural reproduction loop (upper right) and a biotechnology loop that extends life expectancy (middle right). 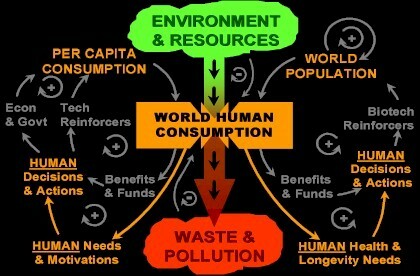 Per capita consumption growth is caused by technology loops (middle left) reinforced by world economics and government action loops (far left). These major loops arise in our society from human needs and motivations (bottom). Environmental collapse, resource exhaustion, and toxic pollution constraints may create negative loops that will finally stop the growth (small loops in the very middle).